← Guess how long the DMV took? Farmers Market is a code name for “Gringo Magnet”. But I don’t care. 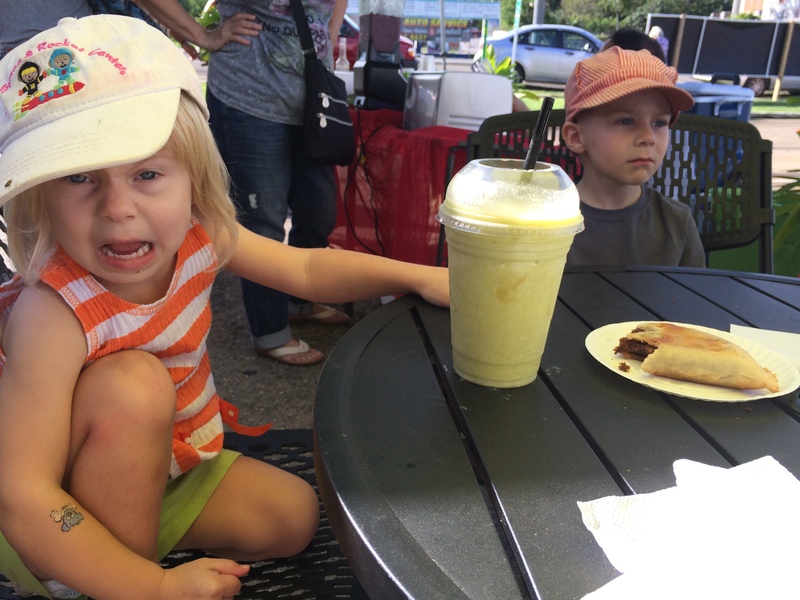 We explored the Aguadilla farmers market and loved it. Located in the parking lot of a Thai restaurant (note to self: try it sometime! ), you should get there early if you’re looking for something specific. Tomatoes, lettuces, fruit, jams, green beans, baby plants, ginger, smoothies, eggs, and hot food – all organic. With some gluten free options too! Two different groups of people were giving away free puppies that they rescued and took to the vets to get shots. 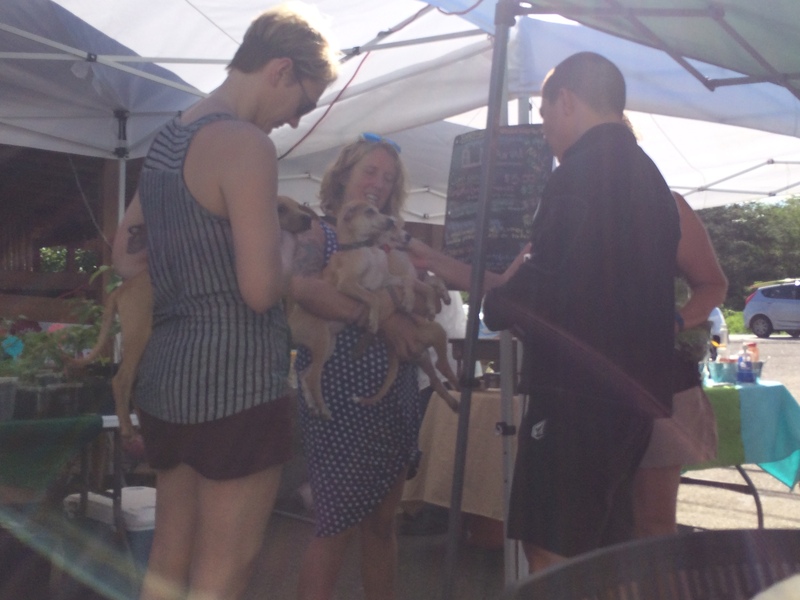 Friendly vendors, free puppies from people who rescued them from a life of straying, and salsa music made for a great atmosphere. And the least smelly porto potties I’ve ever been in. Trevor pointed out this lady’s tattoo. tee-hee. Trevor. 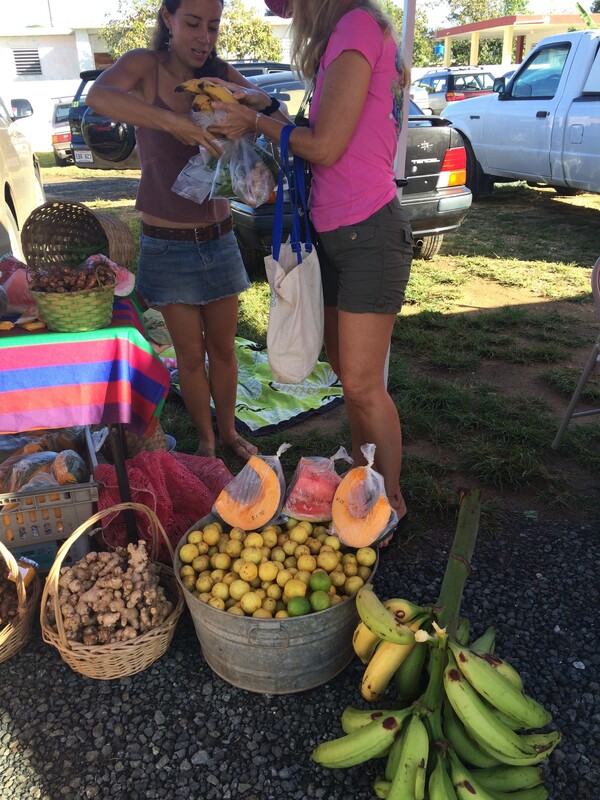 This entry was posted in Uncategorized and tagged Aguadilla, farmers market, organic, Puerto Rico. Bookmark the permalink. 11 Responses to I’m not a hippy. I just eat organic! 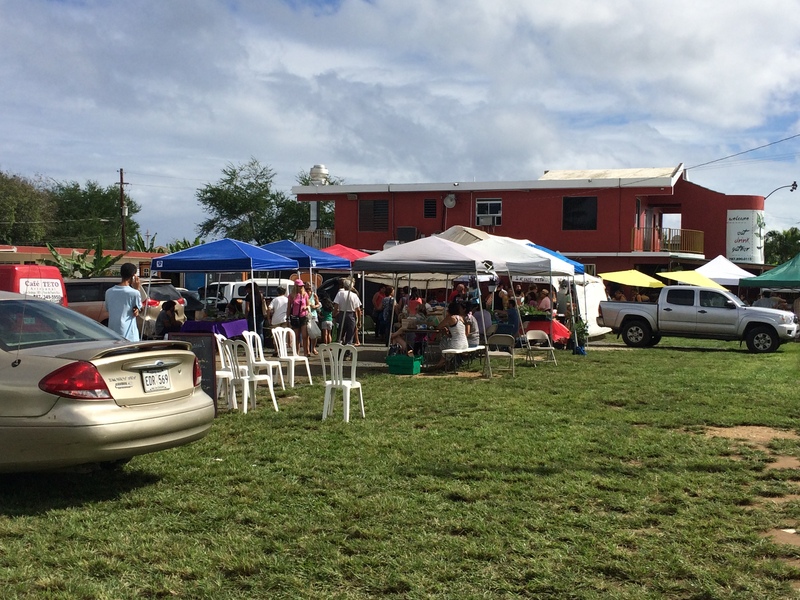 The Rincón farmers’ market is on Sundays from 7am to 1pm or so. It’s grown a lot and is a social hangout too. You might check it out too and it’s a little closer to Mayaguez for you as well. Curious, what days are the Aguadilla farmers market and how do I get to it from Rincon, please? We just returned home from a 17 day vacation and checked out the market in Rincon but it wasn’t as big as this one, it looks like. I do love farmers markets! Great photos! THanks! Jennefer got the details right below here. Saturday mornings at the Thai Restaurant. It’s amazing how much it’s grown! We found it the first weekend we moved here (back in August 2014) and there were maybe 4 tables; not much produce though. The plants that the couple sells are also pretty hardy if you ever want to start a garden! Barbara- thearjet is in Saturday’s from 8-12 or 1?? It’s in the 110 by the Raney base end. It’s in the parking lot of the restaurant called ‘one ten thai’. They are on facebook and Google so you can get directions from Rincon. There are no mile markers on 110 by the way. Thank you so much for the information! Have a great day, ladies! 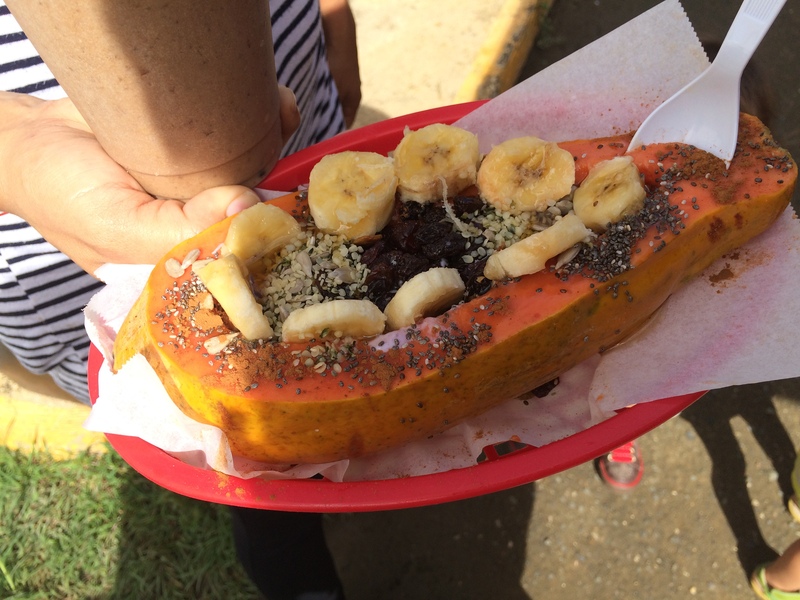 We recently went to the Farmers Market in Aguadilla and loved it. I got some good fresh bread and croissants and some good coffee. My husband fund some “Pana de grano” which are like chestnuts which he loves. I am going next weekend to pick some up for him to send to his brother in Fla. The lady was very nice and is there every week. I also want to go to the one in Rincon but we have to wait a couple of weeks for my hubby to get back from NJ. I see that it is only on Sundays and from 8a-1p. So we’ll have to go to church early or go directly from church, which will work.Looking forward to more of your helpful blogs. I also saw that you mentioned the Ramey Air Force museum which we planning on going to also since my hubby was stationed there from April 1969 until Sept. 1971 right before it closed and we lived in Aguadilla outside the former Gate 1 in the projects. Everything has changed so much since then. Hey there might even be a picture of him since he was a jet mechanic there and also refueled planes and worked at the base radio station. Agggg the memories of simplier times before kids. Take care and keep blogging. Thanks Tonie! I’m glad you’re finding the info helpful. There’s so much to discover on this island! I enjoyed your blog. My wife and I lived in Puerto Rico . we are from the north east corner of Iowa . I exported dairy cattle. 3300 to Puerto Rico in 1975. I have a farm 6 miles above Yabucoa . I bought it to build a dairy but that fizzled then I wanted to raise fresh water Lobster and they will not issue a permit as they are afraid that they will get loose and kill the fresh water shrimp in the rivers and streams. It consists of 217 acres and it has a very good climate at that altitude. You can walk on all of it as it is on top of the mountain range. If you or any one else would be interested it is for sale. It has a FHA loan on it . If you are interested it can be transferred and you pay the back taxes. I agree organic food is the way forward the only thing is the price of the vegetables and fruit,I am not a vegetarian by any means but now a days i am more inclined to eat plant based food as the world is becoming more reliant on processed foods and refined sugar.